In a stunning public announcement made just yesterday, all-but-assured Republican candidate for President of the United States Mitt Romney came out of the closet, declaring himself the first ever "Openly Gray/Bi-Positional" candidate for President in the history of the nation. Speaking before an astonished crowd of supporters at the Fragrance Counter at Neiman Marcus in Greenwich Connecticut, Mr. Romney stated "I decided to come out as gray/bi-positional because I can no longer in good conscience deny my true nature. After all, I didn't choose this lifestyle. I was born this way." 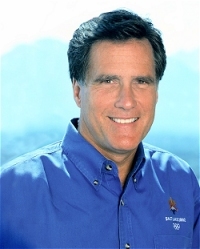 Mr. Romney explained that as an openly gray man, he inevitably sees the "shades of gray" surrounding every political issue, constantly causing him to be "bi-positional," taking positions on both sides of each issue. Despite the shock waves set off from coast to coat, many seasoned observers said they had long suspected Mr. Romney of being gray and/or bi-positional. "I used to work Broadway, " remarked political reporter Nels Noodleman, "and I can spot 'em a mile a way. It's the dyed hair - so delicately greased - the effete manner; why, just look at how he flip flops!" Although Mr. Romney is the first ever openly gray/bi-positional candidate for public office, he is the far from the first ever gray/bi-positional person in American politics. Many experts conservatively estimate that among members of federal, state, and local government throughout the country, approximately 100% are gray and/or bi-positional, plus or minus Ron Paul. Four years ago, the citizens of the United States of America went to the polls and elected the country's first black president. Are these same voters ready to this year return to the voting booths and elect the nation's first openly gray/bi-positional president? "I firmly believe so," said Mr. Romney. "It's not as if I am asking for the right to marry another gray and/or bi-positional president or anything off the wall extreme like that." "I am proud to stand up today for the rights of the gray and bi-positional," added Mr. Romney. "What happens tomorrow, well, I'm gray and bi-positional. We'll see." Funny, Perry! Good analogy to Romney's campaigning MO. Keep up the good work. While I don't mean to imply that I don't believe in full rights in our society for Openly Gray/Bi-Positional Presidents, I would frankly prefer that my son or daughter doesn't marry one. If that makes me a bigot, so be it!